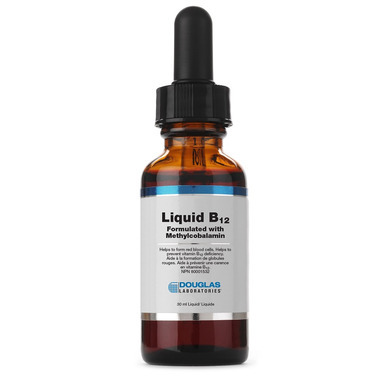 Douglas Laboratories Liquid B12 Formulated with Methylcobalamin provides 1,000 mcg of highly bioavailable vitamin B12 in a tasty and convenient natural cherry-flavoured liquid. Vitamin B12 is essential for the metabolism of nutrients. As a cofactor for methylmalonyl-CoA mutase enzymes, vitamin B12 helps convert odd chain fatty acids and branched-chain amino acids into succinyl-CoA, a common citric acid cycle intermediate. Vitamin B12 also serves as a methyl donor in the conversion of homocysteine to methionine. Most of the vitamin B12 found in supplements is in the form of cyanocobalamin. While cyanocobalamin is an excellent source of vitamin B12, studies indicate that methylcobalamin, a coenzyme form of B12, may be better utilized and retained in the body due to its methyl structure. Certain populations, including the elderly, immunocompromised, users of proton-pump inhibitors and strict vegetarians, are often at risk for vitamin B12 deficiency due to low dietary intake or impaired absorption. This is because they may be unable to effectively produce intrinsic factor, a protein produced by cells in the stomach lining that is needed by the intestines to absorb vitamin B12 efficiently. The taste is great and easy to take every day. I am happy with this product and its quality. Was worried it might have a fake sweet taste but itâ€™s actually just a subtle natural cherry flavor that doesnâ€™t linger at all. Has a marking for half or full dose on the dropper as well.